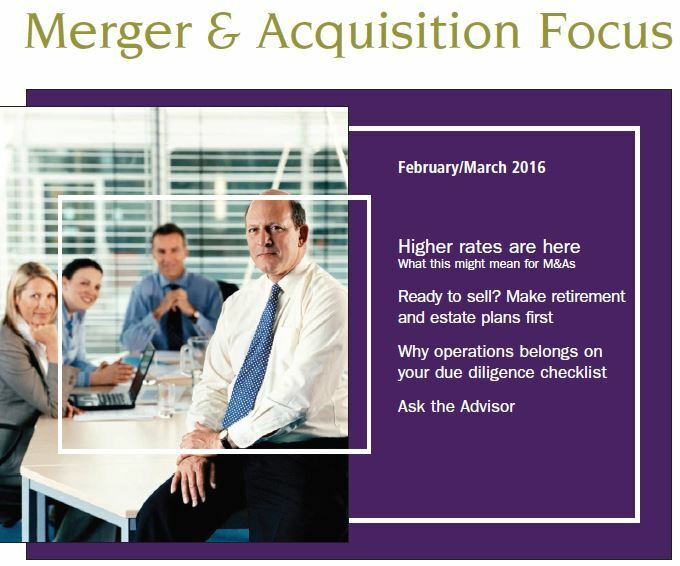 Merger & Acquisition Focus - February/March Edition - Dannible/McKee and Associates, Ltd.
Dannible/McKee and Associates, Ltd. is pleased to present our February/March issue of Merger & Acquisition Focus. In this issue, we look at rising U.S. interest rates, and companies considering a sale or acquisition in the near future need to factor these economic circumstances into their plans. This article covers the anticipated effects of higher rates on the M&A market and explains why certain types of buyers - foreign and private equity - are more likely to retreat. I want to sell, but my co-owner doesn't - what should we do? The ideas we discuss in Merger & Acquisition Focus are relevant to your success, and we would welcome your questions or comments. We realize that we cannot fully address these complex issues in a few short articles, so we invite you to call us at (315) 472-9127 or contact us by email to discuss your needs.